Several post-Olmec civilizations are emerging in different parts of Central America. Hunter-gatherer cultures cover most of North America. The ancestors of the Inuit are arriving in North America. Farming is spreading to eastern USA. The Olmec civilization has appeared in North America. The influence of the Olmec civilization now covers much of Central America. The Mayan civilization is emerging. The Mayan civilization is now emerging. The Hopewell culture has vanished. The Pueblo culture is now developing. The Mayan civilization is now in decline, while the Mississippian culture is rising. The Toltec empire has vanished, and the Mexica people have appeared in history. 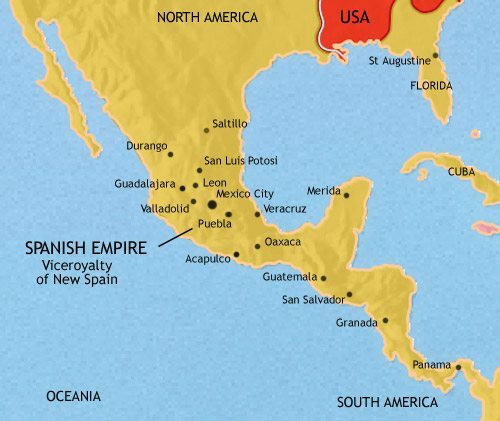 The Aztecs are now building their empire in Central America. 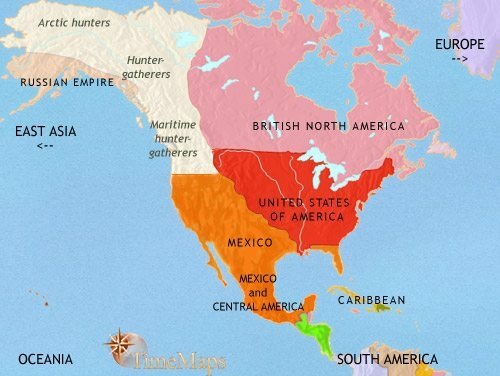 North America is now being colonized by Europeans. The USA is now an independent nation. The USA has purchased a vast territory from the French. 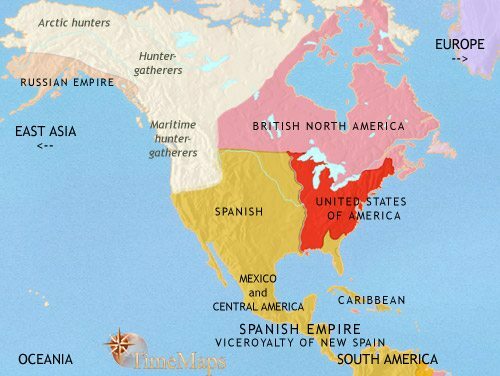 The USA almost tore itself apart in civil war. Canada and the USA have experienced huge industrial expansion. The USA and Canada have fought in the two world wars together. The NAFTA trade agreement is benefitting the economies of all North American countries. Having spread their influence over a wide area in Central America, the Olmecs are now being replaced by several regional centres of civilization, influenced by the Olmecs but with their own distinct characteristics – including, by this date, writing, amongst the Zapotec and Mixtec. This process is being stimulated by a dramatic growth in population, for which there is evidence in both the central basin of Mexico as well as in the Yucatan peninsula. Farming is by now well-established in the arid landscape of the present-day south western USA. It is dependent upon irrigation – although, given the need to exploit all sources of sustenance in this hostile environment, hunting small game remains important. The Mogollon culture is emerging in the area about this time. In the eastern woodland region, the Hopewell people are developing a distinctive culture, derived from the Adena. 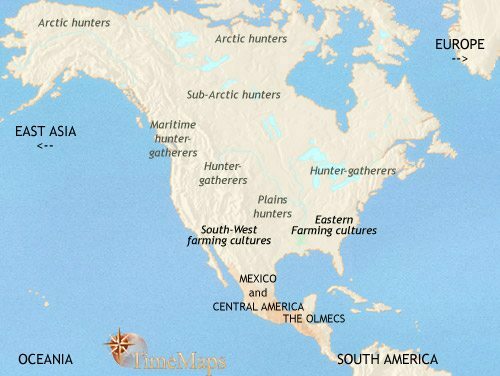 According to most scholars, the peoples of North America came from Asia in c. 10,000 BCE, probably crossing the Bering Straight during the last Ice Age when sea levels were lower than they are today. By 3500 BCE they populate the continent, divided amongst a variety of hunter-gatherer cultures, each adapted to its own regional environment. The only place in North America where the farming way of life can be found is in Mexico, where maize is by now fully domesticated. Even here, the people derive much of their diet from hunting small game. Over the past thousand years farming, based on maize as the staple crop, has begun to spread northwards from Mexico. Nowhere is it the primary source of food, and elsewhere in North America hunter-gatherer cultures prevail. In a few areas, where game and edible plants are particularly abundant, dense populations have emerged, most notably on the Pacific coast of the present-day USA and Canada. Here the plentiful marine life, combined with the rich flora and fauna of the mountains and streams, have allowed large permanent villages to develop. In the far north, Arctic hunters have arrived from northern Siberia in North America in small boats across the Bering Sea. They are the ancestors of the present-day Inuit and Aleuts. At about this time some peoples begin creating elaborate rock artworks on canyon walls and rock outcrops. The most famous of these are to be found along the Pecos river, in Texas. Farming based on maize has continued to spread in North America, and is now penetrating the eastern parts of the present-day USA. In Mexico, farming has now become firmly established as the predominant way of life. Several distinct farming cultures are developing in different areas, and in certain places agricultural techniques are making important advances. In the tropical forests of the eastern lowlands, for example, farmers are learning to construct pools and water-courses to control the flow of water for the intensive growing of crops. During the past thousand years the first North American civilization has appeared. This has occurred in Mexico and neighbouring areas, where several farming cultures now flourish. The most advanced of these is the Olmec civilization. At this date most peoples of present-day USA and Canada still live as hunter-gatherers. However, even at this early date irrigation farming is present in the arid South West. At about this time, in the Mississippi valley, the Adena culture is emerging. It is characterized by the construction of large earthworks for religious and ceremonial purposes. This is the start of a tradition which will last right up to the coming of the Europeans. Over the past few hundred years the influence of Olmecs has spread over a wide area of Mexico and Central America, creating several centres of civilization in several widely-scattered locations. In the Mississippi and Ohio valleys, the Adena culture, famous for producing remarkable ceremonial earthworks, continues to flourish. The past few centuries have seen the old Olmec centres become deserted, but several regional civilizations are flourishing in Central America, the old Olmec centres are now deserted, but several regional civilizations are flourishing. Population expansion continues at a fast rate in several areas, leading to the rise of major urban centres. 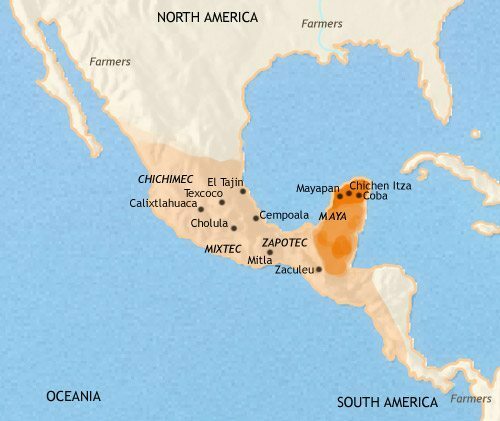 The Mayan people are developing a city-based civilization in the Yucatan Peninsula, in present-day Mexico and Guatamala, and major cities are appearing at Teotihuacan, in the Central Basin of Mexico, and amongst the Zapotec, to the south. In the dry environment of the south-western USA, two other farming cultures, the Hohokam and the Anasazi, have appeared, joining the already-exisiting Mogollon culture. The past few centuries have seen the largest city in all Pre-Columbian history appear. This is Teotihuacan, in Mexico. Meanwhile, the Mayan city-states have continued to develop their distinctive civilization, which is now entering its classic phase. Further north, the Hopewell culture is spreading throughout the woodlands of the present-day eastern USA. In the south-west, the Hohokum are developing elaborate irrigation systems – including dams and a complex network of canals, some taking water 10 miles from water source to fields. Large settlements are appearing; one, Snaketown, covers more than 300 acres. The presence of ball courts, one of the most distinctive elements of Mesoamerican civilization, is strong evidence for contact between this region and Mexico. This has been a period of stability for Mexico, where the great city of Teotihuacan has continued to flourish. Further south, the Mayan city-states are reaching a peak of prosperity. Their civilization is becoming one of the most remarkable civilizations in world history, boasting extraordinary technological and artistic achievements. By this date, the Hopewell culture has vanished. The large, stable communities that were capable of building the large earthworks of the Hopewell have dispersed, perhaps due to over-exploitation of their local food sources. Smaller farming cultures will continue to flourish in the eastern woodlands of the present-day USA. Recent centuries have seen the extraordinary Mayan civilization continue to thrive in Mexico and Central America, while that of the magnificent city of Teotihuacan has vanished. In the south-west of the present-day USA, the Anasazi are developing the famous Pueblo culture, with its remarkable constructions of multi-story, hundred-room houses made of stone and adobe mortar and bricks. Meanwhile the peoples of the lower Mississippi are developing more complex societies than previously. Their increasingly elaborate culture involves the building of huge flat-topped pyramid mounds, made of earth, upon which wooden temples are erected. Recent centuries in Mexico and Central America have seen many of the historic Mayan city states have fallen into catastrophic decline. Mayan civilization continues amongst the cities in the north of the Mayan homeland, but its classic phase is reaching its end. In central Mexico, a people called the Toltec dominate a large area, ruling from their capital city, Tula. The peoples of the Mississippian culture are developing far-ranging trading networks which spread out to cover the whole area between the Atlantic Ocean and the Rocky Mountains. Large towns are appearing along the banks of the great rivers of the region, centres of trade, religion and probably political power. In North America, population growth has continued, and with it competition for land and resources. More complex societies and more powerful chiefdoms have evolved. Long-range trade networks have reappeared, spanning the continent from coast to coast. In the present-day eastern USA, the largest Pre-Columbian towns north of Mesoamerica have grown up, especially the town of Cahokia, which straggles for miles along the banks of the Mississippi. In the south-western USA, the Pueblo culture has experienced a militarization of its society; villages are being relocated to more defensible sights. In central America, the Toltec empire has vanished, its capital, Tula, sacked by the Mexica, a people from the north. In the far north, the Inuit have spread out over the Arctic region as far as Greenland. There they encounter the first European settlements in the New World, belonging to the Norse colony in Greenland, founded in 987. The past couple of centuries have seen the Aztecs, an alliance of groups of whom the Mexica are the leading element, become dominant in Mesoamerica. In the South-West of the present-day USA, a long dry spell has had a disastrous impact upon the agricultural societies of the Hohokam and the Anasazi. Many farming villages have been abandoned and people have moved away from their historic homelands. Climate change may also have been responsible for changes in societies of the east. There has been a marked upswing in violence between communities, and urban centres such as Cahokia have been abandoned. Other centres continue in being, though none are on the same scale as before. The Norse settlements on Greenland have vanished, possibly victims of a colder climate and of the continued Inuit expansion across the Arctic region. The previous two centuries have seen dramatic changes in the racial and cultural make-up of North American populations. These stem from the arrival of Europeans to the continent, in the wake of the voyage of Christopher Columbus in 1492. 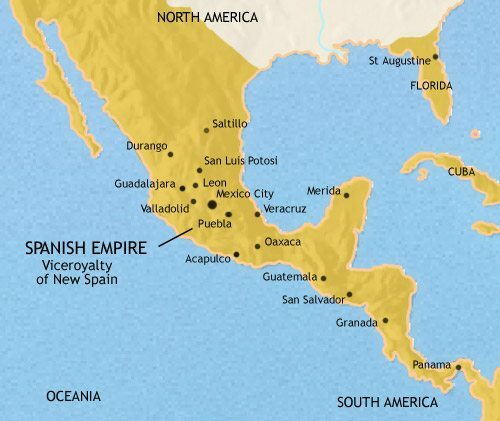 In the south, Mexico and Central America have become part of the huge Spanish empire. Spanish explorers have ventured up into the southwest USA, followed by a handful of missionaries and traders. There has, however, been little by way of settlement in these arid regions. 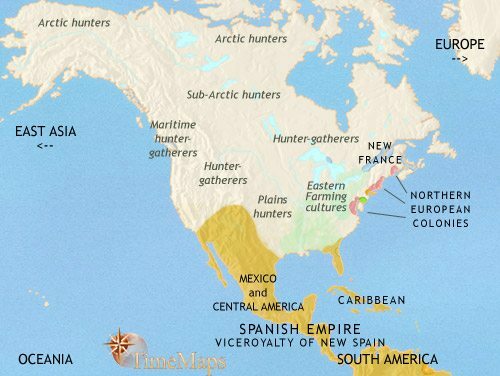 Much more recently, northern Europeans – mostly from the British Isles, but also some French, Swedes, Dutch and Germans – have established a string of colonies on the eastern seaboard of the present-day USA and Canada. Their populations are increasing rapidly, and soon more colonies will be founded. As the European population rises, that of the Native Americans falls sharply. Deadly European diseases, to which the natives have no resistance, fan out across the continent, carrying away the majority of their people. The past century and a half has seen prosperous societies of European culture take firm root in eastern North America. Most of the British colonies on the eastern seaboard have rebelled to form a new nation, the United States of America. The small British colonies in present-day Canada, together with the old French colony (which had previously fallen to the British), remain under British rule. Much of the rest of the continent is under Spanish rule, which, in North America, is centred on Mexico. Several Native American groups near the eastern seaboard have been drawn into European conflicts as allies of one side or another, French, British or American. On the Great Plains, meanwhile, the spread of escaped Spanish horses has transformed many societies. Tribes who previously lived as sedentary farmers now form highly mobile groups, hunting the vast herds of bison from horseback. Such is the bonanza that many Native American groups have pushed into the plains from surrounding areas and adopted this lifesyle. As yet, European penetration of the central regions of North America is limited to isolated forts, trading posts and mission stations. The dominating theme of recent decades has been the westward expansion of the USA, aided by the acquisition of vast new lands (esecially in the Louisiana Purchase of 1804) and the strong, steady westward migration of settlers. To the north, society in Canada remains anchored to the east, but fur trappers have pushed along the rivers and lakes far into the interior. Mexico, which covers a vast area of the continent, has now become independent from Spain. White settlement in the interior of North America remains very scattered. The Great Plains mostly remain the domain of bison-hunting Native American peoples. Over the past decades the USA has continued to acquire vast new territories, taking the nation right to the Pacific. It has been an unstoppable movement against which Mexico has been unable to stand. In the far north-west of the continent, the USA has purchased Alaska from the Russians (1867). The geographical expansion of the USA is accompanied by dramatic economic and demographic growth. It has also been punctuated by a terrible Civil War between northern and southern states (1861-65). To the north, Canada has also seen great geographical expansion. It has been evolving a federal political system, and redefining its relationship with the mother-country, Britain. The recent decades have been years of unprecedented industrial expansion, laying the foundations for the continent’s pre-eminence in the 20th century. Transcontinental systems of transport and communications – the railroad, the telegraph and the telephone – tie the economies of the USA and Canada into an integrated whole. The continued westward movement of peoples focusses on the settling of the US Mid-West and the Canadian prairies. Millions of new immigrants boost the population. New cities arise, and older ones expand out of all recognition. Mexico does not share in this growing prosperity. It is now experiencing the start of its two-decade long Revolution (1910-29). Over these past few decades, the exepriences of the USA and Canada have been broadly similar, though with significant differences. For both nations, despite the Great Depression of the 1930’s, the general trend has been towards greater and greater prosperity: the spread of automobiles and good roads; of radios, TVs, refrigerators and other consumer goods; of industrial mass-production, and skyscrapers changing the skylines of all North American cities. Both nations fought in World Wars 1 and 2. However, the Americans went through the Prohibition years, whilst Canadians did not; and the Canadians, with their close ties to Britain, entered both wars at the very beginning, whilst in each case the US came in later (but then made a decisive difference). As of 1960, both the USA and Canada stand together as close allies and as members of NATO against the Communist threat. Mexico remains far poorer than her two northern neighbours; however, she has made substantial progress, both economically and politically, since the end of her Revolution in 1929. The past few decades have seen North American living standards, already the highest in the world, continue to climb. 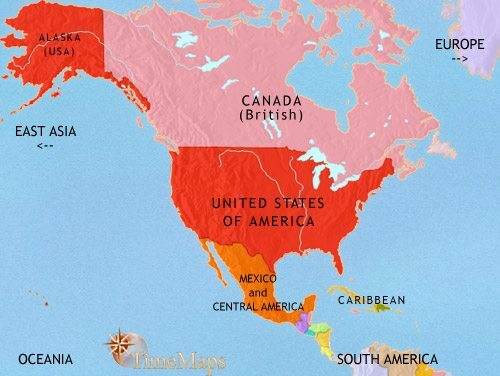 The signing of NAFTA (the North American Free Trade Agreement, signed 1994) has welded Canada, the USA and Mexico more closely into one pan-continental economic area. Canadian and US economic integration, already strong, has been enhanced still further, and the presence of Mexico within the agreement has provided a major boost to that country’s prosperity. Other less welcome links between these countries have been apparent in the illegal drugs trade, which has undermined law and order in significant portions Mexico and caused immense misery there, and the increasing flows of migration, much of it illegal.